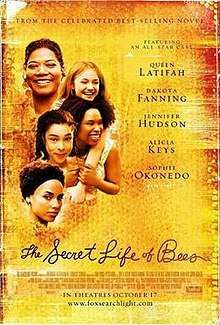 The Secret Life of Bees is a 2008 American drama film, adapted from the novel of the same name by Sue Monk Kidd. The film was directed by Gina Prince-Bythewood and produced by Lauren Shuler Donner and Will Smith, with his wife, Jada Pinkett Smith, as executive producer. The film is noted for Queen Latifah's critically acclaimed performance as August Boatwright. The film was released in North America on October 17, 2008, and in the United Kingdom on December 5, 2008. Lily Owens lives on a peach orchard, in South Carolina in 1964. Her father T-Ray is widowed, abusive, and often angry with her. On her 14th birthday, the harvest is starting, societal and personal unrest consumes her life, and a string of events, a mix of mystical, terrifying, and unjust, pushes her to run away to find a better life. With Lily goes Rosaleen, their housekeeper. Lily is blonde and naively confident; Rosaleen is African American, in her 20's, politically aware, and proud. Rosaleen was beaten up by 3 racists and ended up in police custody as well as in the hospital. Lily later, after having an argument with her father, helps Rosaleen escape from the hospital. Lily has but a few hoarded mementos of her mother, dead almost 10 years. One is a label: "Black Madonna Honey", Tiburon, S.C., and Tiburon becomes their destination. In two days they reach Tiburon and find their way to the home of August Boatwright and her sisters May and June. August has used her skills as a beekeeper to build a successful business. She has also built a strong community of black women who gather regularly in prayer, overseen by a life-sized statue of a black woman whose arm reaches out in blessing. Despite the unlikeliness of Lily’s lies about their circumstances, August takes them in, in trade for labor. Lily becomes an apprentice beekeeper. She discovers May’s “wailing wall”, tucked full of little notes about events that have distressed the brittle sensitive May, and she learns about the "Black Mary" in the living room. In time Lily confides her truths in Zach, the teenage son of one member of the prayer group and August’s assistant beekeeper. They try to watch a movie together, but her disregard for racial barriers, sitting with Zack in the “colored” section, gets Zack kidnapped and roughed up, and Lily yelled at. To protect May, June and August hide the news, but Zack's mother cannot, and the event breaks May. Though Zack is returned the next day, it is too late for May who in pain has drowned herself. With May's funeral comes some reconciliations and truths. June, strong and proud, agrees to wed her long-time boyfriend. Rosaleen is asked to be part of the household family. Lily, who already believes she probably killed her mother, as we see in flashbacks, now blames herself for Zack's kidnapping and May’s death. She smashes several jars of honey and packs her things to run away, unloved and unloveable. Before she runs, August challenges Lily’s outlook, and tells her about Lily’s mother, whom August cared for as a child and later sheltered from T-Ray. Simultaneously T-Ray has sleuthed out her location. Lily does not want to leave, especially with him, and the three women form a phalanx of support. T-Ray admits that her mother would probably have taken her had she not been killed, and with angry reluctance leaves her to be raised on the Boatwright farm. The movie closes with an older Lily narrating as she tucks a journal of the story into May’s wall. Production began on January 7, 2008, in Lumberton, North Carolina, and Watha, North Carolina. and ended a few months later. The film was screened in September 2008 at the 33rd Annual Toronto International Film Festival, and had an October 17, 2008, theatrical release. Original music for The Secret Life of Bees was produced by Mark Isham. "Baby, I Need Your Loving" by Lamont Dozier, Brian Holland and Edward Holland, Jr.
"Come See About Me" by Lamont Dozier, Brian Holland and Edward Holland, Jr. The soundtrack for the movie was not released as an album. The Secret Life of Bees received mixed to positive reviews. Rotten Tomatoes gives the film a score of 59% based on 136 reviews, with the consensus "The Secret Life of Bees has charm, but is largely too maudlin and sticky-sweet." Writing in The New York Times, reviewer A. O. Scott thought the film to be "a familiar and tired fable". Roger Ebert found it "enchanting". The movie was No. 3 at the North American box office for its opening weekend with $10,527,799. As of December 13, 2008[update], the film has made $47,270,658 in the United States and Canada. The movie won the awards for "Favorite Movie Drama" and "Favorite Independent Movie" at the 35th People's Choice Awards. The film received seven NAACP Image Award nominations, which include Outstanding Motion Picture, Outstanding Actress in a Motion Picture (Queen Latifah, Dakota Fanning), Outstanding Actor in a Motion Picture (Nate Parker), and Outstanding Supporting Actress in a Motion Picture (Alicia Keys, Jennifer Hudson, and Sophie Okonedo). The movie won the Image Award for Outstanding Motion Picture. ^ "Dakota Fanning Interview, PUSH", MoviesOnline.ca. ^ "The Secret Life of Bees". Rotten Tomatoes. Flixster. ^ "A Golden Dollop of Motherly Comfort". The New York Times. ^ Ebert, Roger. "The Secret Life of Bees". ^ "The Secret Life of Bees". Box Office Mojo. IMDB. Retrieved February 7, 2010. ^ "'Dark Knight,' Ellen are People's Choice". MSNBC. Buncle, Ross (Mar 14, 2009). "The Secret Life Of Bees". Movie reviews. Boomtown Rap.